In this episode of Inbound Sales Journey, Gray and Ryan discuss what you can do to keep your clients focused on their goals during an engagement. When working with clients, it can be easy for them to lose focus on why they came to you. They start looking for another flashy solution, change what their objectives are, or focus on metrics unrelated to their goals. 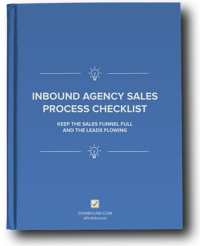 A client engagement can soon become your agency being paid to crank out content as a vendor. An agency needs to educate the customer, define the strategy, and create a marketing plan to help the business achieve their results. Get them to focus on a few specific goals and then show that you will be implementing your marketing strategy to get them there. Your job is to take them from point A to point B! It’s your job starting in the sales process to set these expectations. You need to be clear that you are in charge of strategy and the plan. You don’t want to be stuck as a tactician. The strategy is what an agency is for, to provide value and deliver results. You need to be upfront, clear and push back if a client or prospect tries to take charge. One other way to keep your clients focused is with your client reporting. You want to make sure that the primary focus is results based. If you want to be seen as a strategist, then report on results and not only deliverables! Keep them on task throughout the engagement. Be the one who steers the ship. Clients will appreciate and respect that you’re taking control of the situation. You want them to feel they’re getting their money’s worth for working and developing and implementing the plan to solve the solution they came to you for. Don’t be afraid to remind them about why they hired you in the first place. If you’re tired of clients that lose their focus, realize that it’s up to you to fix this, starting back in the sales process.